For the 1986 game, see The Great Escape. 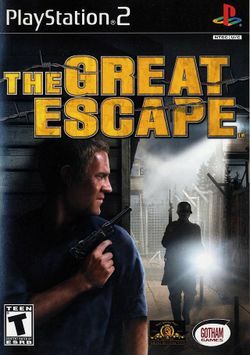 The Great Escape is a game based on the 1963 movie The Great Escape. It was released in 2003 by UK developer Pivotal Games and published by SCi Games (now known as Eidos), who had purchased the rights for the game from MGM. The game was released on PlayStation 2, PC and Xbox. It reached No.2 in the UK charts upon release. Shot Out Of The Skies. Imprisoned deep behind enemy lines. Command your team of prisoners to break free and strike at the Reich! Based on the MGM classic film, superstar Steve McQueen is digitally resurrected to star in this saga of courage and heroism. Triumph over the evil Nazi Empire as the mastermind of the Great Escape! This page was last edited on 5 May 2009, at 02:05.